Club Car, the world’s largest manufacturer of small-wheel, zero-emissions electric vehicles, has announced the launch of a new line of Carryall® Utility and Transport vehicles. To be introduced January 2014, the new electric and petrol products retain the core components golf course managers have come to rely on in previous Carryall Utility and Transport vehicles, with significant enhancements that improve functionality and performance. Headlining a long list of new developments is the launch of a new Subaru petrol engine – bridging the gap between vans and electric utility vehicles – that boosts horsepower by 30% and also efficiently manages fuel consumption, using up to 50% less than previous Carryall Utility and Transport vehicles. 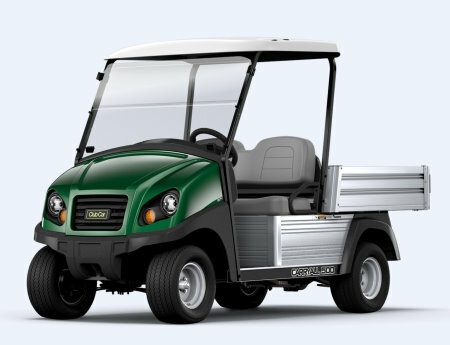 Club Car’s new electric Carryall Utility vehicles will also feature an industry exclusive combination of an on-board, high frequency charger with an integrated cord retractor as standard. The solid-state, global charger is 92-95% efficient, a 10% increase over the old charger, helping golf courses optimise efficiency. Improved vehicle styling, draws inspiration from the automotive industry, and sees new headlights and tail-lights built into the vehicle giving an enhanced, integrated feel. And larger cowls, made of exclusive ArmorFlex material, also deliver a stronger look and feel, while bumpers and fenders are made of a resilient, virtually unbreakable plastic. In another first, and to deter unauthorised use, common fleet keys have been upgraded to an uncommon automotive-style key switch, for additional security. “The new Carryall utility vehicles raise the bar for utility and transport vehicles and offer our on-course and commercial customers a viable option over trucks and vans,” added Marco Natale. Standard features, incorporated from the original Carryall range include exclusive rustproof, aircraft-grade aluminium frame and body, self-compensating rack-and-pinion steering, independent front suspension system and unparalleled reliability. In addition to work utility vehicles, the Carryall line includes Transporter transport vehicles, which can carry up to six passengers, as well as street-legal Carryall LSVs (low speed vehicles).